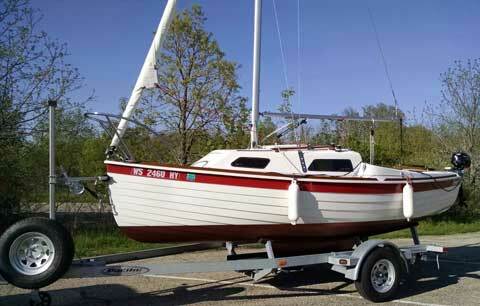 2013 Sage 17 sloop sailed only in fresh water and stored inside during winter. 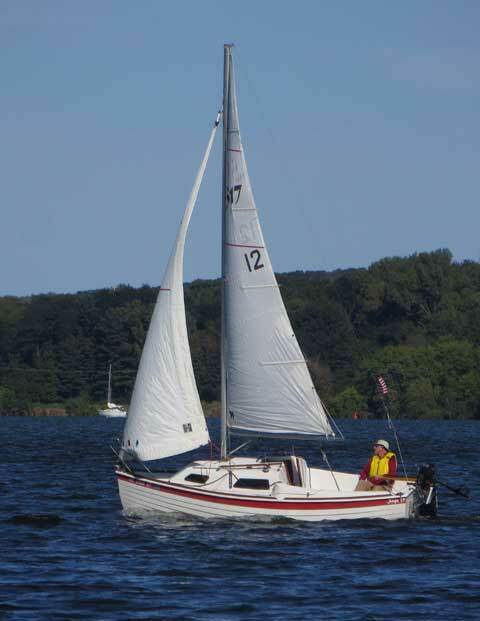 draft is 1' 9" with centerboard up and 3' 6" with centerboard down. Weight about 1300 lbs with 520 lbs as lead ballast. 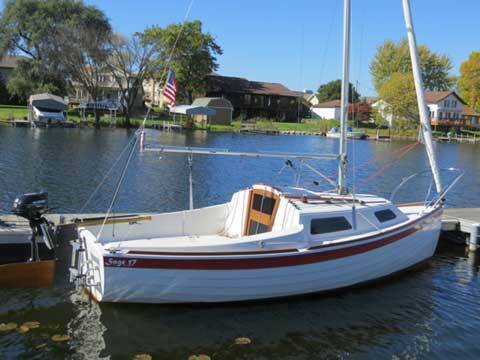 Fractional rig includes Hyde 98 sq ft mainsail (two reef points) and Hyde 65 sq ft "lapper" jib purchased in 2013. 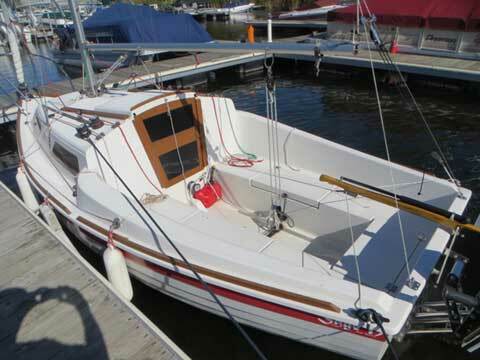 Full array of sail controls accessible in cockpit for single-handed sailing. The 6' 6" inch long cockpit seats up to four people, is self-draining, and has 3 storage lockers. 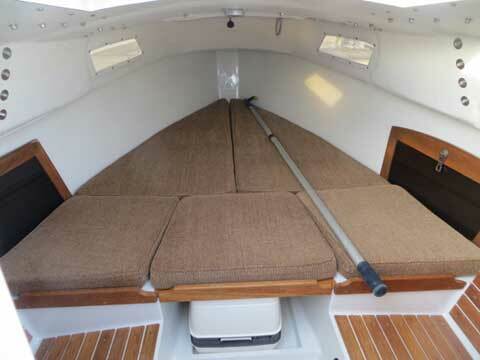 Cabin has V-berth and cushions, storage bins, two teak side seats, 4 ports, sliding main hatch, and opening forehatch. 2013 Pacific trailer with tongue extension, LED lights, no maintenance wheel bearings, and spare tire. 2013 Suzuki 2.5 hp outboard mounted on adjustable motor bracket. 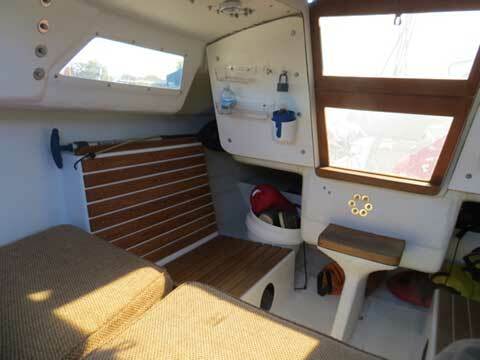 Accessories include on Schaefer Snapfurl for jib, three Harken winches, extra spinnaker halyard, Boomkicker, tiller extension, TillerClutch, foam flotation in hull, swim ladder, teak trim, teak floor grating, flotation cushion and type-2 life jackets, portable LED navigation lights, Thetford porta potti, Danforth-type anchor with chain and line, fenders, dock lines, extendable boat hook and paddle.